I had heard that this novel was a good read from several friends/reviewers, but I was not in any hurry to read it as I have so many other books. However, then the movie was released and had great reviews! My fiancé wanted to watch it, so I had to step up my game and read the book before we could watch the movie together. I suppose I went into the book open-minded, but expecting something enjoyable. I had no idea I would have such a good time reading a science fiction novel! Mark Watney is stuck on Mars after a mission went wrong. His team believe him dead, so they left Mars to travel back to Earth without him. The novel follows Mark’s trials to stay alive and make it back to Earth with only the items he is left with. Occasionally the narrative switches from his first-person narration to third-person when we take a look at the NASA employees/Houston back on Earth, trying to figure out what to do next. I didn’t mind this narrative switching; it felt natural, and emphasised the importance of hearing Watney’s story directly from him. There was quite a lot of science and technology described in the novel - procedures Watney needs to follow or equipment he needs to use - but I never felt like this was overwhelming or that it made me feel stupid. Each step Watney takes is explained well and the reader can see the reasoning behind his actions, even if they cannot specifically imagine exactly what is happening. 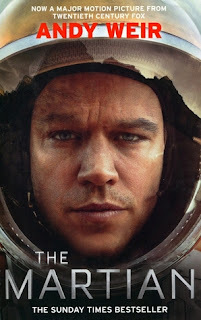 I really got absorbed in the story and kind of felt like I was along for the ride with Watney. For example, when he has to figure out when he can be rescued and how long he has to survive, and on what food, I felt sympathy with him the whole way through. The best thing about this novel is the excellent sense of humour Watney retains, the whole time he is on Mars. He doesn’t give into the isolation and go crazy, and he doesn’t give up. He is positive and humorous throughout, which kept me rooting for him to get back to Earth. I think Weir writes people perceptively well. The conversations between the NASA employees, the frame of mind of the crew who left Watney behind, and Watney’s survival motivation are all portrayed wonderfully through realistic dialogue. I would recommend this book to anyone - seriously, even if you don’t think you like science fiction or space or survival stories, please try this one out because it’s a pleasant surprise! Weir has created a wonderful, interesting adventure.